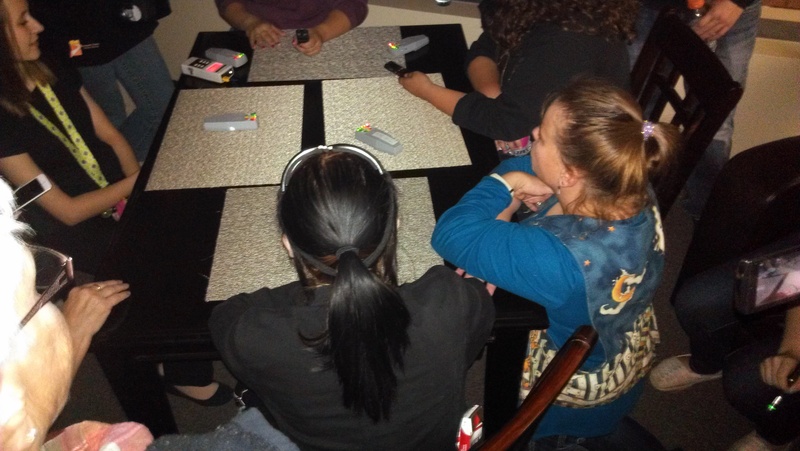 Staff working that evening were: Micki Gilmore, Bianca Jorgensen, Shannon Fetch, Hannah Yeager and Cheyenne LeFaivre. Bianca arrived a bit early and heard voices in the building so she turned on music until the rest of us arrived. Staff was to arrive at 7pm. We started setting up the Multi-Purpose Room and heard footsteps in the Gallery. There was an electric feeling I the air for sure. It was decided that Shannon and Hannah would write down notes of things said by staff or attendees. The reason for this is in the past we missed things that could be important. Hannah’s notes-7:00 to 7:30 – Micki & Bianca have been hearing the front door moving. No one is there. 7:25 – Shannon was in the restroom and felt someone pushing on the stall door. Patrons started arriving about 7:45pm and we opened the doors and began as usual. We started in the Lady’s Restroom as usual. The group gathered and we started asking questions. The KII’s lit up several times and it seemed “someone” was with us. Activity was ok but slowed a bit. We moved on to the Youth Services area where noises were heard. We then moved on to the Young Adult area. Not much happened at either place. We then continued on to the Staff Lounge. Once inside the Staff Lounge and questions were asked we seemed to get answers by the KII’s lighting up. There was not a feeling of a charged room like we usually get. It was a somewhat quiet tour. Hannah’s notes-8:45 – Bianca & Hannah are sitting at the entrance and hear a “knocking” sound; almost sounds like a ball bouncing? Shannon’s notes-We heard footsteps in the gallery while at the YS desk. Patron reported seeing a shadow along the back wall of the library. Two others said they too saw something. A green light or dot was reported in the stacks by the books-on-cd. Several people saw it. No report from Bianca yet available. Hannah’s Notes-9:00ish – Noises like the building settling? 2nd tour arriving. 1st tour ends at 9:17. Somewhere around this time Cheyenne was in the gallery and felt a hand on his leg. 9:30 – Patrons in the bathroom catch EMF readings on their phone. K2 meters go off in response to the name Gretchen in the bathroom. While standing in the gallery, Hannah hears voices in the bathroom. The name Elizabeth has come through on a patron’s device. Hannah and two others patrons hear “creaking” noises at the circ desk. Hannah thinks it is the building settling at first, and finds no source of the noise. EMF spikes in YA. Hannah hears footsteps in the stacks. Bianca asks how many ghosts are with us; 8 spirits in the staff lounge verified by K2. meters. (At this time my head starting to hurt very badly and my chest got tight.) Cheyenne & Hannah have been having allergy problems all night? Two attendees are so pleased they bought two extra available tickets for the tour. Hannah’s notes-10:45 – 3rd group arrives. The tour starts at 11:05. Bianca sees a figure in the back hall, she thought it was Cheyenne but he was in the MP room with us. Hannah hears voices in the gallery but there is no one there. This group was high energy as they walked in. Several attendees were there for a second or third time doing a Ghost Walk. They knew what might happen and they arrived so they brought good vibes. This does help. We entered the Lady’s Room and after asking questions we got many KII hits. Because of time we continued on to the Youth Services and then Young Adult areas. For some reason there was not much activity in those areas for the night. That is a bit unusual. The group moved on towards the Front Desk. Bianca and Cheyenne stopped us telling us they saw a young boy in the mirrors by Young Services. He looked to be squatting by the DVD racks. They turned and tried to get a photo but he was gone. The group became very excited. We continued up to the Staff Lounge. Someone mentioned they felt something different in that area. Electricity. Everyone got settled. I sat on the register vents and began asking questions. While researching for the book we are writing, I discovered there had been very hard feelings between a local family and the city regarding the moving of a headstone and grave. I asked if the man that has been seen was indeed him. All four KII’s lit to red or full. That is an amazing answer and does not happen often. I continued to ask questions about him and again it seems we got our answers. The KII’s lit again to full or red. This continued for about 15 minutes. Very cool. This went on for some time. Everyone was very excited and happy with the results. Hannah’s notes 11:35 – Bianca & Hannah hear voices while sitting in the entryway. Shannon’s notes-Strong smells of cologne were reported by the Front Desk. Patron reported hearing voices that were not with our group. A patron had the laser grid and while holding it they noticed “something” blocked the light or grid. Micki and Shannon followed being it was the last tour. Again the Lady’s Restroom was good activity. There were several hits with the KII’s. Moving on the Youth Service and Young Adult areas did not have activity. The tour group continued to the Staff Lounge upstairs. We asked the spirits to let us take their photo and said “Would you stand by the door that says “Staff Lounge” and allow us to take a photo of you after I count to three”. Everyone cleared the area for a few minutes. We took photos. (No results yet). Just after a woman stepped toward the cleared area in front of the door. She suddenly felt very odd and light headed. We asked if she was ok and asked her friend to watch her. A few minutes later she felt even more disoriented and we asked her to sit down. She said she felt “so odd”. Once she moved from the area it all stopped. Several people asked to go into the actual restroom part of the Staff Lounge. Once inside they started asking questions and the KII’s and EMF/with light & sound started lighting and sounding off. They all were fully lit. They opened the door so we could see what was happening. I asked them to come out slowly and invite the spirit to follow them. It did seem to do so. Kenedie Grant was holding the orange topped EMF and it was continuing to light up and sound off. As this was going on Bianca was holding an IPhone video recording the lights. Suddenly Kenedie jerked as if she got an electrical shock. We all thought she was hurt or something. We all asked was she OK. The look on her face was something. She said she was ok. It took her a minute to compose herself and she then explained that she felt “someone” stroke her hair from the top of the back of her head to her shoulder area. She stated it just shocked her and that she was ok. Kenedie has helped with many Ghost Walks and is experienced in what happens or can happen. This was still a shock even for her. Everyone was really jazzed after these two incidents. Hannah’s Notes- 12:15 – 4th group arrives and commences the walk around 12:40. All female group! Shannon & Hannah heard a high pitched noise while in the bathroom? Kind of a “ping” sound? Maybe the piano? While in YA Hannah and a patron hear a door shutting. It was very cold in the office. K2 hits on the stairs in response to Elizabeth. Hannah hears the banned book flags moving as if someone is moving down the stacks. As more information is received it will be posted. Thank you everyone that attended. Photo by Cindy Camacho. In our neck of the woods Debra Munn is a very well recognized name. She is in fact the author of the book Ghosts on the Range: Eerie True Tales of Wyoming. Included in Ms. Munn’s book is a chapter dedicated to the Sweetwater County Library titled The Library Built Over a Cemetery. The book was released in 1989. 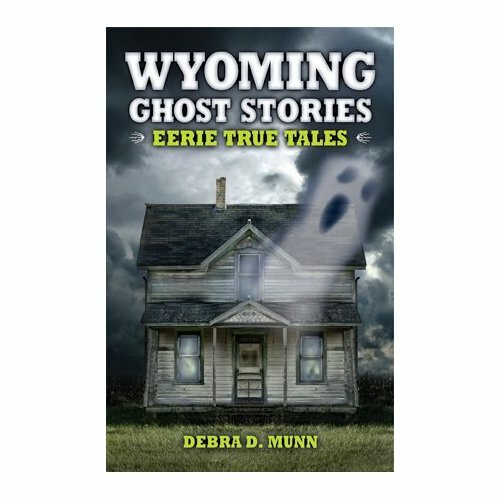 In 2008 an updated and revamp telling of most of the original tales was released as Wyoming Ghost Stories: Eerie True Tales and the chapter about the library is now called A Grave Library. About the Author: When she isn’t collecting ghost stories, Debra D. Munn enjoys writing fiction, essays, and articles on a variety of subjects, including Great Britain and travel. She received a Ph. D. in American literature in 1982 and now teaches college creative writing classes. Also a freelance editor, she resides in Powell, Wyoming, with her husband, Scott Foll. *2013-Ms. Munn currently lives in England with occasional trips back to the U. S.
Ms. Munn has also written other books and they are Big Sky Ghosts, Montana Ghost Stories, and Sussex Haunted Heritage: Historic Properties Open to the Public. If you think that ghosts inhabit only old, run-down buildings, think again. The Sweetwater County Library in Green River was opened as recently as 1980, yet it appears to be one of the most haunted spots in Wyoming. And no wonder, when you consider that it was constructed on top of the city’s oldest cemetery. When housing for veterans was constructed in the area during World War II, it soon became obvious that not all the bodies had been exhumed in 1926. As more remains were discovered, they, too, were reinterred in the new cemetery. After the veterans’ residences were no longer needed, the old cemetery grounds were left alone until 1978, when the library purchased them for the site of its new building. As soon as the groundbreaking began, however, workers made yet another grisly discovery: according to architect Neal Stowe of Salt Lake City, from eight to twelve more bodies were found in unmarked graves! “A heavy Caterpillar was going back and forth, loosening and moving the soil,” he explained. “I walked right through the middle of the site, where something that looked like a deteriorated coconut was sitting on top of some freshly churned dirt. I picked the thing up, turned it around, and recognized it as part of a skull. Little tufts of dark brown hair were still clinging to it. 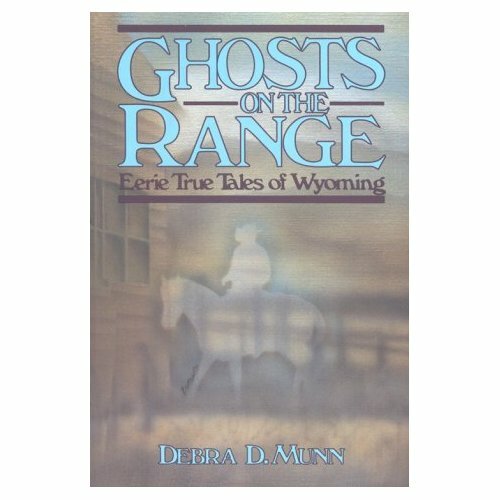 If you would like to read more go to your local library and request Debra D. Munn’s Ghosts on the Range.